Following a judge's temporary restraining order, Yahoo! Argentina has blocked all web searches for the country's most famous son: notorious football cheat Diego Maradona. As discussed by the OpenNet Initiative (ONI) - an academic partnership intent on exposing net filtering across the globe - Argentine judges have issued more than 100 search site restraining orders over the past two years in an attempt to expunge allegedly inappropriate references to some of the country's most recognizable names. This ongoing net censorship crusade came to a head in September, when Yahoo!, Google, and other search engines were ordered to remove vast swaths of content involving Maradona and high-profile judge María Servini de Cubría. The order did not bar all Maradona links. But according to Yahoo!, the language was so broad that blocking content on a site-by-site basis wasn't an option. "Yahoo! was founded on the principle that access to information can fundamentally improve people’s lives and we are actively defending these lawsuits in the spirit of that vision," read a canned statement Yahoo! tossed our way. "This litigation undermines the immense value of the internet as a worldwide vehicle for sharing information. These lawsuits exploit the law to limit freedom of expression and ultimately harm the many ordinary Internet users in Argentina who turn to search engines like Yahoo! to find information." Google, however, is still returning Maradona results. Millions of them. "If a judge comes to us and says that particular pages must be blocked, we will block them," Alberto Arebalos, Google's director of Latin American global communications and public affairs, told The Reg from his office in Argentina. 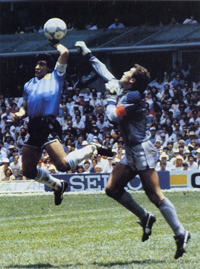 "But there is no reason to block all references to Maradona." So, Google Argentina isn't filtering as extensively as Yahoo!, but it is filtering. As the ONI points out, if you search for "susana gimenez sexshop", Google Argentina turns up a trio of links from the Chilling Effects Clearinghouse - an organization that tracks net filtering and notifies web users via the search engines themselves. Yahoo! told us it attempted to satisfy past orders by blocking individual sites. But as the scope of the orders grew, the company couldn't satisfy the courts. The fines pilled up, and in recent months, it has resorted to blocking all sites involving the celebrities in question. Arebalos indicated to The Reg Google had received fines related to these orders as well. Until the ONI began questioning its practices, Yahoo! didn't alert users that results were removed. But on Monday, the site added a short notification to filtered results pages. "Con motivo de una orden judicial solicitada por partes privadas, nos hemos visto obligados a suprimir temporalmente todos o algunos de los resultados relacionados con ésta búsqueda," the site now reads following Maradona searches. Roughly translated: "On the occasion of a court order sought by private parties, we have been forced to temporarily remove some or all of the search results relating to it." Most of these Argentine restraining orders were driven by a single lawyer. In suing the big search engines on behalf of his celebrity clients, Martin Leguizamon Peña claims he wins restraining orders 80 per cent of the time. "Basically, this is one man's campaign to censor the internet - and he's doing a very good job of it," according to Christopher Soghoian, a researcher with Harvard Law School's Berkman Center for Internet and Society who helped pen the ONI's blog post. "At the urging of this aggressive lawyer, judges are essentially holding these internet companies hostage."